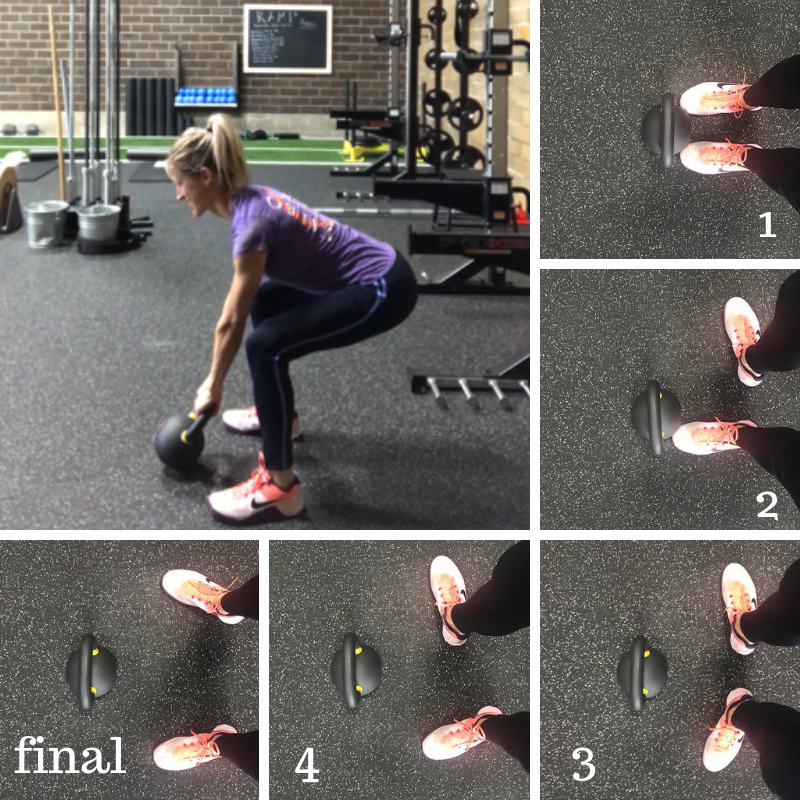 Foot position is crucial for a safe, strong lift and here we want to show you two of our most common Kettlebell exercises and how to properly set your feet up for them. For any exercises involving a swing-start or just the plain-ol-swing itself, place the KB on the floor, then stand with the tips of your toes on each edge of the bell (pic 1). Rotate your feet 90-ish degrees out (pics 2 & 3) and then swing your heel back to line up with your toes (pic 4); toes turned out ever-so-slightly so knees track over them. Now you’re the perfect length and width away from the bell (pic: final). Grab the bell, shift all the weight back to your hips to pre-load these muscles, almost like you’re going to fall over if you weren’t hanging on to the bell. Now you’re ready to propel your hips forward and hike the bell back between the upper legs to produce a powerful and safe swing! I know that was a confusing description for such a simple move…Click here to check out a 10-sec video instead to see this foot set-up in action. For any exercise calling for a ‘dead’ start, place the bell between your feet (arch area) with the horns (handle) back by your heels. As you grab the horns with straight arms, sit back and down with your hips, as to ‘wedge’ the them under your shoulders while creating some upward pull on the horns prior to starting the rep. Then push down into the ground with your feet as you stand by simultaneously straightening knees and hips. The bell will naturally pick as you propel the hips forward, so no picking up with arms (arms remain straight). 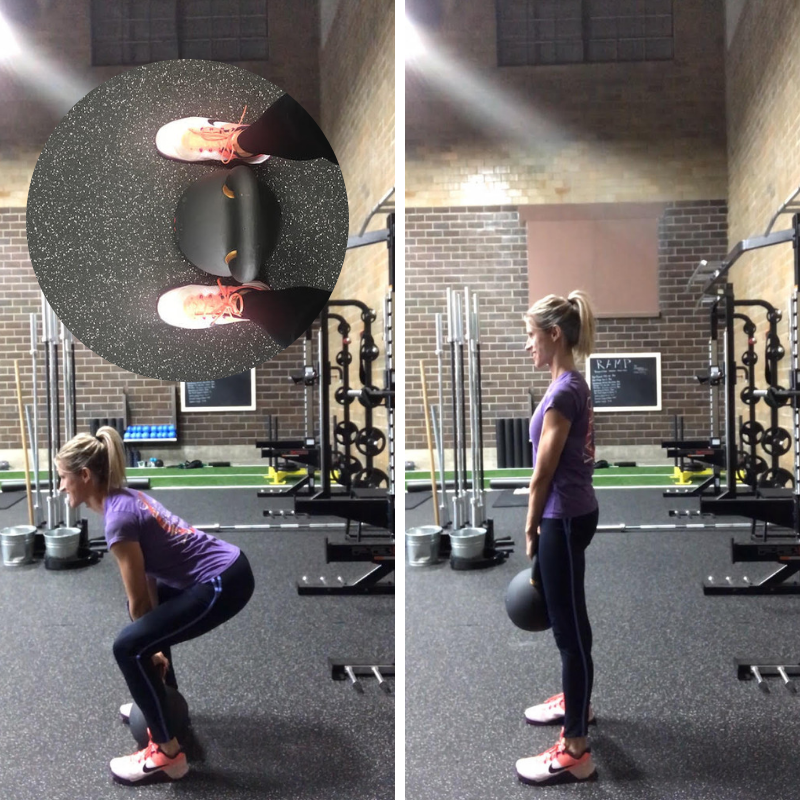 We hope this helps you better understand the difference in foot and bell position for the swing and deadlift motions with the kettlebell.